Cleanup Crew - Mission Accomplished! There are few Scouting events that require minimal preparation, are fun, educate youth about ecology and contribute substantially to your community as picking up trash! 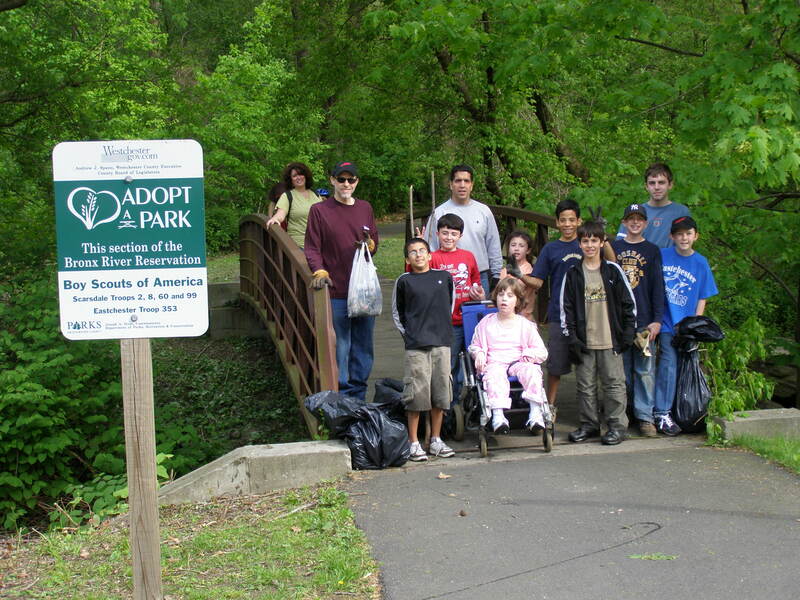 Troop 353, along with three other local troops, has adopted a portion of the Bronx River Reservation park to keep free from accumulated garbage. This area has a paved walkway for cyclists and strollers alike and is heavily traveled. Since the paved walkway runs along side the Bronx River it is also a natural habitat for all types of stunning wildlife. As you can see in the accompanying pictures a solid contingent of youthful habitat explorers turned out one Saturday afternoon to run through the wood and then pick up some trash! Brother Ted & Scouts in Memorial garden. This year’s Good Turn Service Project work weekend at the Graymoor Monastery produced two salutary benefits for its participants: 1) creation of a trail to a favorite place of meditation, and 2) the establishment of a competitive culinary cookoff! Under Brother Ted Novak’s careful guidance, Troop 353 scouts and scouters worked dilligently during the day to clear a trail through an unkept area that has proven to be a place of frequent meditation by the many visitors that come to the Graymoor Monastery. The roughly 100 yard trailblaze was lined with downed logs and indigenous rocks while overhanging tree branches were pruned. At one end, a trail entrance was marked with 2 small bird feeders, a gift provided to the monastery by a local gardening center. Afterwards, Brother Ted once again gave us a tour of his beloved Memorial garden, honoring those whom perished on 9/11/01, and detailed discussion of the background of the many contributed fixtures. Scouts clearly were appreciative of Brother Ted’s garden. The emotionally moving experience is a keen reminder that a Scout is indeed “reverent”. After a day of hard, but satisfying, work, the Old Goat patrol prepared dinner for everyone. To set the tone for the Iron Chef Breakfast Cookoff the next morning, which required the inclusion of apples, Scoutmaster Tom prepared an Apple Crisp treat in a dutch oven. Though the crust was partially burned, the tasty late night dessert was fitting end to our industrious campers after a long day. The next morning Brother Ted Novak eagerly arrived as the judge of the Iron Chef Breakfast cookoff. The two competing entrees each had the prerequisite apple content and all boys had labored furiously to create the ultimate breakfast treat. Both entrees made liberal use of various apple-enhancing spices from the newly-acquired patrol spice kits: vanilla, nutmeg, cinammon, sugar, etc. In the end, Brother Ted chose the Apple Fritter entree over the Apple Pancakes. Afterwards, Brother Ted faithfully led the troop in a contemplative prayer service, utilizing select Native American passages from the Troop’s Inter-faith Prayer Service booklet, revealing the diverse and always interesting background of all those that come to worship at the Graymoor Monastery. Good work and good pictures can be viewed here.